The NFL and the New England Patriots have lost a lot with the retirement of Robert James Gronkowski​. 'Gronk' was not only the greatest tight end of his generation and one of the most unstoppable, unplayable, un-markable players in sports, he was the league's greatest entertainer. He was the greatest personality the league had in its arsenal, perhaps even ever had - or, in the parlance of our times (yes, a 'Big Lebowski' reference is very on-brand for Gronk, why do you ask?) the GPOAT. In essence (and again, in the parlance of our times - because that's how the bit works in the film: repetition) he was 'a lot', but loveably so, even if his sheer indomitable spirit and power were one of the three principal reasons for the Patriots near-unending dominance over the past decade. What makes this 'a lot'-ness even more impressive is that thanks to the demands of the position and a severe predisposition to injury, it was consigned to just nine years of action. And it's not like Bill Belichick and co. were unaware of the issues plaguing the Arizona Wildcats Junior at the time of the 2010 Draft - he'd missed almost all of his third year through back problems, an ailment that has ultimately pushed this premature departure from the sport. They were just savvy enough to realise that his talent could overcome it. It was Live Fast Die Young-ian and it paid off. All of which brings to mind two prominent Brazilian faces from the turn of this century: Ronaldo Luis Nazario de Lima and Ronaldo de Assis Moreira. 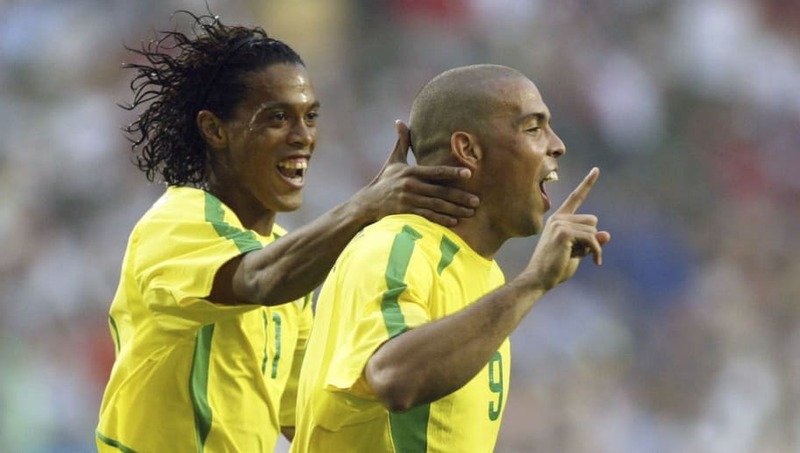 Or, in the parlance of our ti- well, actually no, just the parlance of Brazil: Ronaldo and Ronaldinho (Little Ronaldo). That distinction in their names was not just a word count filler. It was important because it sets apart not just the differences between the two, but directly outlines the different attributes that Gronk shares with them. And, if you were paying attention, these are evident. Perhaps the greatest weapon Gronkowski possessed was his ability to stay calm and perform at the highest level when the stakes were at their highest. Actually, 'stay calm' is an insult. The 29-year-old didn't just 'stay calm' and maintain his composure, he rose to another level. In his pomp - and even not - you could throw almost everything you had at him as a defence - double coverage, triple coverage, a truck - and it wouldn't matter. He would find a way to get through/around/over it anyway. With the second most goals ever at the World Cup, I think O Fenomeno can relate to that. And how about an unwanted predilection for serious injury? That, of course, is the fable that these two great men elicit. Sometimes you can be too good, too athletic, burn too brightly. Of course, the NFL star's first back issue occurred before he had even entered into the league, whilst Ronaldo's first serious knee issue came in 1999, six years into his professional career. But both issues pre-dated their rise and it was their inordinate talent that eventually told. Thanks to a condition called trochlear dysplasia, Ronaldo's knees were always less stable than normal, but this would not have been too great a factor had he not been the most explosive player of his generation in his early days at PSV Eindhoven, Inter and Barcelona. Similarly, it is inconceivable to think that Gronk would retire just nine years into his professional career were he not so damn good and therefore such a lightning rod for the kind of hits players shouldn't come back from. So, clutch - check. Injury issues - check. That's Rob Gronkowski. But what about showmanship? Unbridled personality, on and off the field? That's where Gronk comes in, and where, in turn, Ronaldinho does too. Few players have dazzled us so delightfully in football than the wondrous former Barca man. But even less have done so with a near-constant smile plastered across their face. Don't get it twisted, both were formidable professionals, but they rarely let the moment eclipse what they deemed their primary role on the field to be - to entertain. The Patriots have always been the defence-first destroyers of the league. They've been the do-your-job party poopers. The win-at-all-cost dynasty. Essentially, the complete antithesis to the M.O of the Selecao. But, in Gronk, they had a morsel of redemption from this narrative arc. He was the light, smiling, bubbly, stirringly showy saviour that kept them from complete and utter contempt. With his departure, the dark side has won. They have lost their honorary Brazilian. Football has not had an entertainer like Ronaldinho since his farewell. Whether the NFL will in the wake of Gronk's retirement is a question that will be reverberating around the league's headquarters, and those of Patriots Nation, as we speak.